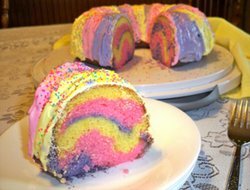 When you cut into this Rainbow cake you get an extra surprise. Not only is the frosting rainbow colored but the cake is too. This makes a fun birthday cake for kids or just a special treat anytime of the year. The recipe below calls for a cake mix and a can of frosting but you can make most any homemade 2-layer white cake if preferred, along with homemade frosting. Make sure you use white cake and white frosting to achieve the rainbow coloring when adding the food coloring. Preheat the oven to 325 degrees F. Generously grease the entire inside surface of the Bundt pan; set aside. Prepare the cake mix according to the instructions on the package. Divide the batter evenly into 3 smaller bowls. In the first bowl of batter add just 1 or 2 drops of red food coloring to make pink. Add more food coloring if necessary to achieve the color you want. In the second bowl add yellow food coloring, again starting with 1 or 2 drops until achieving desired darkness. To the third bowl of batter add a drop of red and a drop of blue to create purple. Adjust coloring as needed. Once you have all the colors done, start layering the batter in the greased pan. Starting with yellow, add half of the batter, then half of the pink, and then half of the purple. Be careful when adding the batter so that you pour the batter as evenly as possible without mixing the colors together. Repeat the layers in the same order using the remaining batter for each. Without disturbing the layers, place the cake in the preheated oven. Bake as directed on cake mix package. When done, remove the cake and allow to cool for 10 minutes before removing from the pan. Turn out onto your cake plate and allow to cool completely before frosting. Divide frosting into 3 separate bowls and color with food coloring, making the same colors as used for the cake. Stir coloring in until evenly colored. Add coloring a drop at a time until you achieve the desired colors. Note: Be careful to add just a drop at a time when adding the food coloring. You do not want to add too much coloring and have the colors get too dark. Once they are too dark there is no way to correct the color other than starting over. Spread the different colors in strips around the cake, alternating the three colors as you move around the cake. After the cake is frosted, sprinkle with multicolored sprinkles or crystal sprinkles.